(updated) Sitting on the steps in front of the Metropolitan Museum of Art is one of those iconic things to do in New York City. 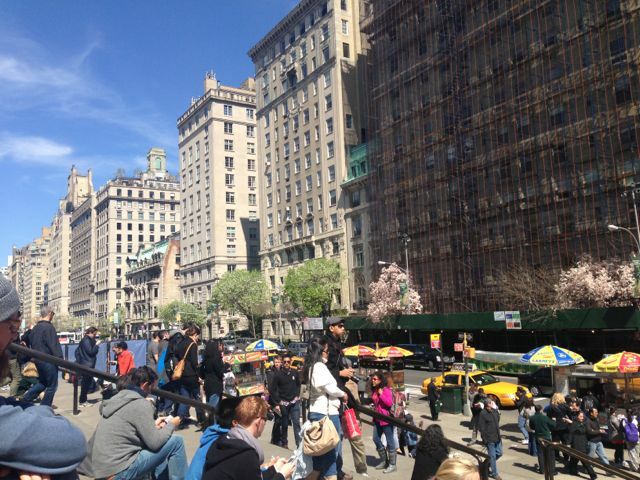 On a sunny day, the wide steps can become crowded with the young and old, the tourist and the resident. It's tempting to stay awhile and soak in the sun and the sights. 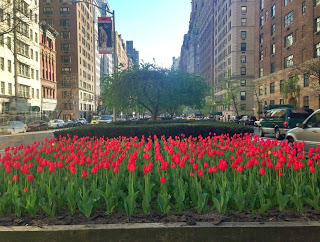 Everyone has reasons for lingering there, with one being the shared pleasure of people watching along this expansive stretch of Fifth Avenue, a painting come to life. Certainly, just getting off one's feet for a moment is welcome, especially if the previous hours involved walking through the entirety of art history from prehistoric to the contemporary. The Metropolitan Museum of Art should be a singular pilgrimage, uninterrupted by feeble attempts to take in more exhibitions along Museum Mile. Pity the poor visitor who tries "to do" multiple museum exhibitions in one day, albeit ambitious, noble, and uplifting. Like the city itself, a place of too many possibilities that can often paralyze decision-making (i.e. "Where do you want to go to dinner?" "I don't know" "Let's eat leftovers") , a satisfactory stroll through the Met necessitates editing out certain galleries and saving them for another day. While a time-demanding pleasure palace, the Met is still within easy walking distance of many other spots, some of which involve great coffee, nature, books, sumptuous architecture, and world-class cocktails. 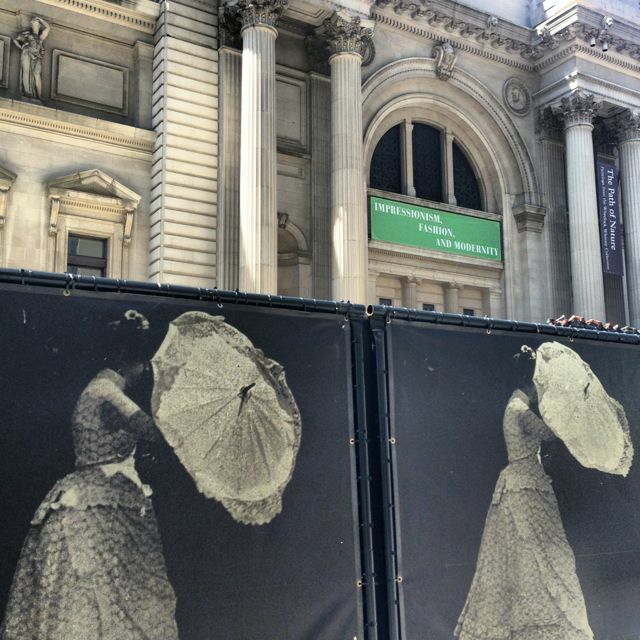 So, when you find yourself sitting on the steps at the Met, recognize that many opportunities await nearby. 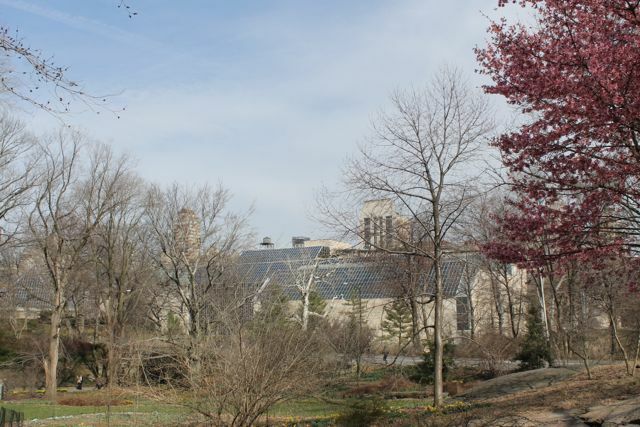 Behind you to the west are treasures within the great leafy expanse of Central Park - the Ramble and the Shakespeare Garden, among them. In your line of sight, stare ahead at East 82nd Street and think about getting up to look at the mansion on the corner. Know, too, that within a block or so from here, formally-dressed bartenders are polishing their counters and ready to take your order. Please don't attempt all 25 of the following things in one outing. Choose maybe three or four of them in combination with the museum. Curate thyself. Or, as they say where I grew up - be particular. 1. Metropolitan Museum Historic District. East side of 5th Avenue from E. 78th to E. 86th St. through Fifth and Madison Avenues (approx.) Fans of Beaux-Arts architecture, with its neoclassical riffs on Gothic, Renaissance, Romanesque, and other varieties, will enjoy looking at the many bas-reliefs, classical ornaments, and balustrades throughout the district. 2. Central Park: Pat Hoffman Friedman Playground, with Paul Manship's sculpture Group of Bears (1932, cast in 1963). The charming small playground just to the south of the museum makes a good spot to rest or to plan the afternoon. 3. Central Park: The Ramble. 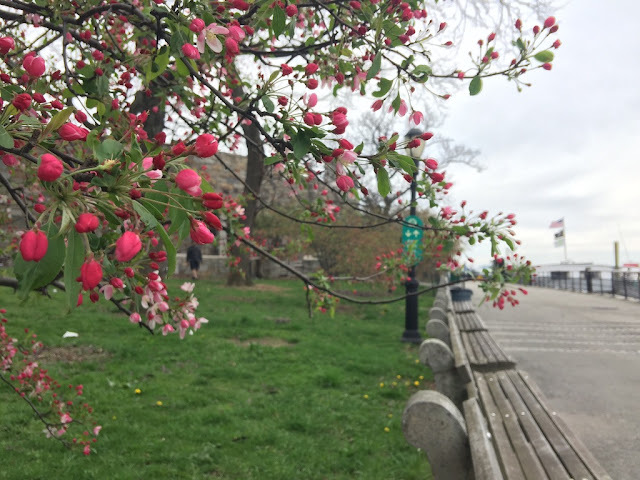 A 38-acre site of wild woods, outcroppings of rock, man-made rustic features, and confusing trails, all set to the tune of birds, sits roughly between 78th St. on the north and 73rd St. on the south. 4. Central Park: The Obelisk. The oldest man-made object in the park, and better known as Cleopatra's Needle, this granite monument indeed dates from the days of the pharaoh, circa 1450 BC. After it was carted over to the city, in February 1881 a large crowd watched in wonder as workers pulled the Obelisk into its full and upright position. 5. 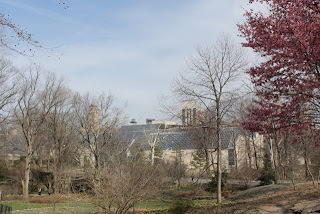 Central Park: Belvedere Castle, Delacorte Theatre, Shakespeare Garden. A trifecta of Central Park icons, grouped together. The Delacorte is home to The Public Theatre's Shakespeare in the Park. The garden next door features seasonal plantings accompanied by quotations from the Bard. Belvedere Castle, an architectural folly created by park co-designer Calvert Vaux, offers an excellent high view of the Park below. 6. Central Park: South Gate, Central Park Reservoir. The reservoir, named after Jackie Kennedy Onassis, was originally built as a water supply for New York. Decommissioned for that purpose, the Reservoir is a lovely thing to behold, especially as a home to many waterfowl. 8. 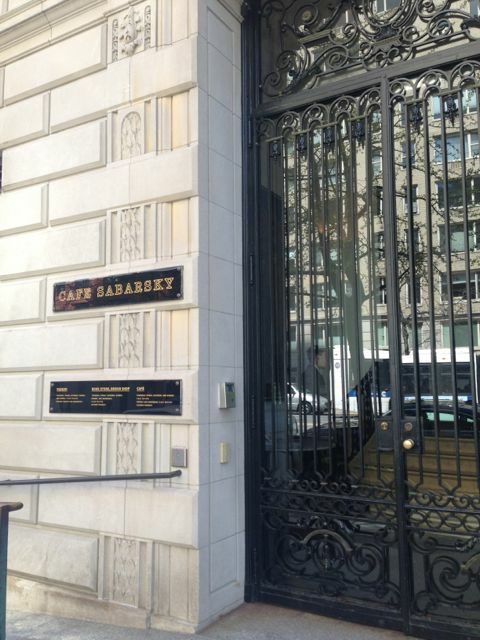 Café Sabarsky, 1048 Fifth Avenue at 86th St. If you're not visiting the Neue Galerie (above), at least step inside the museum and get in line for the best Viennese coffee and pastry in the city. If the line is long, head downstairs to the more informal Café Fledermaus. Same menu, same coffee, same apple strudel. 10. 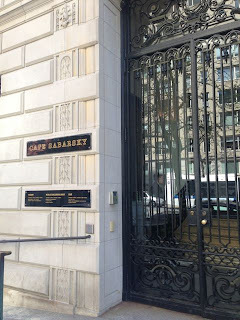 The New York Society Library, 53 E 79th St. Ambling east on 79th, you will encounter the library. Despite the snooty sound of the name, this noble institution was born of civic-minded types who wanted books to be made available to the public. After earlier locations in the southern parts of Manhattan, in 1937 the library settled comfortably into this Italianate house. More at the official website. Let's Talk: I will interrupt this listage for a moment to state what's becoming obvious. 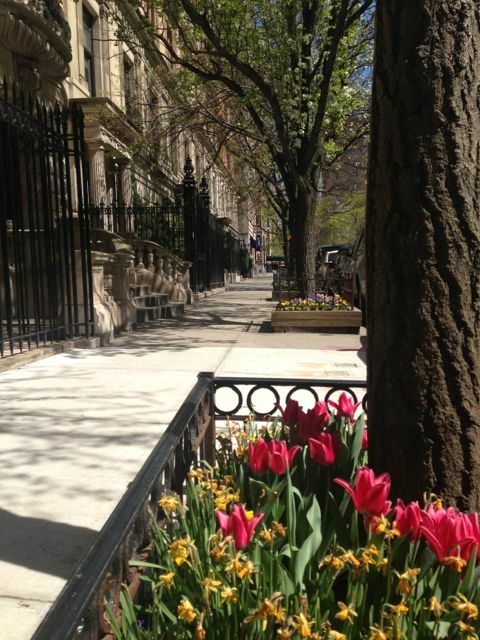 Yes, we are going very "uptown" for this swing through this Upper East Side neighborhood. When in Rome, do as the Romans, etc. etc.. Though I am personally not fond of the luxury aesthetic in a general way, we will just have to pull ourselves together and wear smart clothes. Pull a $20 bill out of the wallet to cover the coffee and the strudel at the Cafe Fledermaus or wherever, and then another $20 (maybe a little more) for a drink in one of these smart hotel bars, and let's be done with it. We can always go home (or the hotel) and change into jeans and find cheap beer in the Village for later. We should also remember to join the Metropolitan Museum of Art as a member, so we don't have to agonize over the "suggested" price of admission or be sad about not getting the member discounts at the museum's formidable gift shop. All this walking around business is free. I'm glad we had this talk. 22. JG Melon, 1291 3rd Ave. near E. 74th. Classic New York pub, with big burgers and drinks just the way we like them. 23. Park Avenue Christian Church, 1010 Park Ave. at 85th Street. We're going to church. Twice. Our first stop is a French Gothic-inspired church with buttresses and Tiffany windows. The structure has served as home for the South Dutch Reformed Church, the Park Avenue Presbyterian Church, and now the Disciples of Christ. The latter shares space with the Reform Temple of Universal Judaism. A welcoming place in the interfaith spirit. 24. Church of St. Ignatius Loyola, 980 Park Avenue. 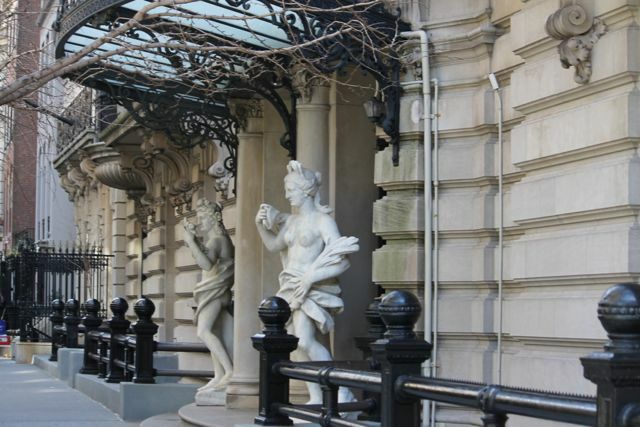 Built in 1898 by the Jesuit-controlled Roman Catholic parish, the stately classical facade is a real head-turner on Park Avenue. 25. Park Avenue. 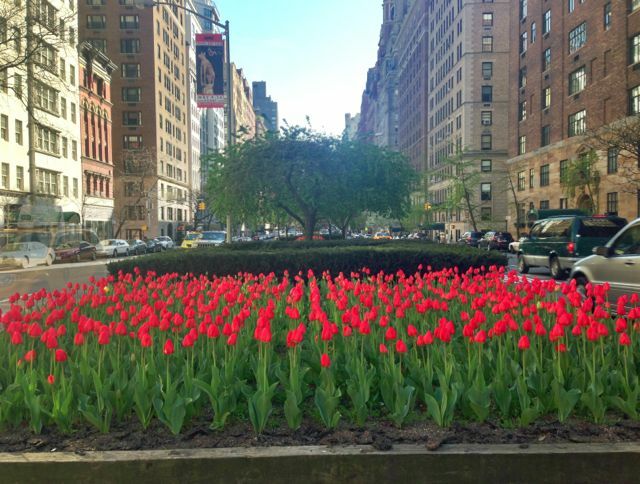 While burdensome to walk at times, this stretch of Park Avenue is nicely landscaped, especially throughout the medians. 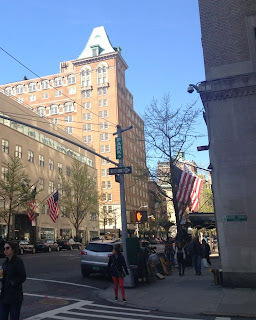 Before heading to the 6 train on Lexington at either the 86th or 77th St. stops, take a final long look up and down the wide boulevard before heading home. Final thought: Remember to stay creative and improvisational at all times. Cherish favorite places in the city, but never forget to experience new things. Like a museum, living in New York always presents familiar galleries, but the discovery of unfamiliar paintings in the next room is what really opens up the doors. 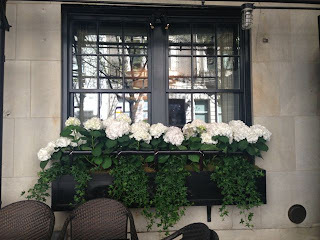 Images by Walking Of the Big Apple. Mobile: You have a phone, yes? While sitting on the steps of the Met, locate "Walking Off the Big Apple" on your phone's browser and find the streamlined mobile version of this website, complete with interactive maps. You are good to go. 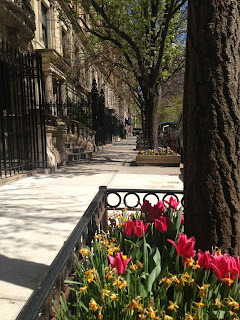 Park Avenue is very nice this time of year, though still wide and difficult to walk across in a leisurely way. 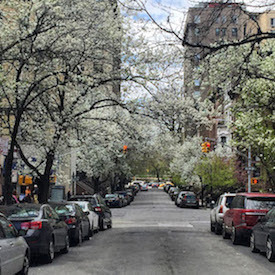 Walking Off the Big Apple features self-guided tours to neighborhoods, streets, cultural history, good books, architecture, museums, parks, landscapes, and offbeat travel experiences in New York City. Older posts will sometimes be updated to reflect relevant changes in the city, i.e. store or restaurant closings or transit information. Writer and editor Teri Tynes created Walking Off the Big Apple in the summer of 2007. Follow Teri on Instagram for more frequent posts. Text and images (except where noted) by Teri Tynes. All rights reserved. Simple theme. Powered by Blogger.